In our earlier posts on Anti-Strategy—situations wherein well-intentioned employees act against company interests—we’ve explored this all-too-common issue, some of its symptoms and how it shows up in various business functions. Today we consider the root cause: poor and/or untimely information availability and its damaging effect on a company’s culture. Absent information, particularly in a dynamic business environment, people tend to project fears. The resulting self-preservation mode can foster either of two extremes, Anti-Strategy cultures: “robotic” or “chaotic.” The robotic culture cultivates “drones” throughout the organization and a business that’s stuck in neutral or worse. On the other hand, the chaotic culture features extremes of “survival of the fittest” at the expense of organizational harmony and effective execution. The table below broadly portrays the two types of cultures fueled by poor information and how related Anti-Strategy problems play out. Following this plan will provide departments and employees with a clearer sense of purpose and they can see how their efforts and results align with the strategic goals. We will discuss “Cascading Objectives” and the tools to enable them in a future blog. Communication, follow-up, leadership commitment and refreshing your strategies and metrics is a necessary ongoing, key business process ensuring that Information Gaps don’t prevail. 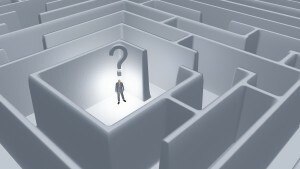 Most companies feel the effects of Anti-Strategy and Information Gaps in one area or another, but often don’t know why. As part of its Company Physical®, Group50 offers a Data Acquisition and Management Assessment focused on identifying how to properly set up management dashboards that will eliminate the information gap. About the author: Bruce Dougan is the head of Group50’s Organization Design and Development Practicewhich provides Talent Management assessments and workshops. Bruce and the Group50 team are all former executives from well-known manufacturing and distribution companies who understand what it takes to design, train, develop and motivate organizations to successfully implement a company’s strategic plan. Group50 has designed a series of strategic assessments, workshops and strategic execution tools that will optimize your organization. Call us at (909) 949-9083 or email us at info@group50.com.